The Sony Ericsson Xperia active runs Android 2.3 Gingerbread, with a custom skin and a nice package of apps. The corner-based homescreen of the Xperia minis makes a comeback. You get five homescreen panes to fill with widgets, shortcuts or folders, and the corner drawers are visible on all screens. With a minor exception: if a widget is too big (the People widget for example) it hides the top two corners. We quite like Sony Ericsson's Overview mode on the homescreen. You pinch to zoom out on any of the 5 homescreen panes and a new pane sets in with a cool transition effect to display all of your active widgets. If there is not enough space for all the widgets, they start floating on the screen overlapping. The Overview mode is similar to HTC’s Leap view or what Samsung have in TouchWiz. However, widgets are not ordered in mini screens, so small that you cannot actually see what’s on each of them. Widgets are shuffled together instead so they can better use the space. They are as big as possible and thus easier to tap on. The four corners can host up to four shortcuts each, as easy to assign as a simple drag-and-drop. If a corner has a single shortcut (just the dialer for example), the respective app launches automatically upon a tap. If there is more than one shortcut - the tab expands into a jog wheel so you can make your choice properly. You can't put folders there though. Inside the main menu, you will see shortcuts in the bottom corners. They let you sort the icons within the grid – you can either go for the automatic options (alphabetical, most used or recently installed) or you can manually move the icons. The Sony Ericsson Xperia mini supports both static and live wallpapers. There are 15 static wallpapers and a single live one (Maps), but you can always get more at the Market or use a picture from your personal gallery. The Xperia mini has themes enabled too but the implementation is pretty basic: a theme only changes the wallpaper and the system menus. On a positive note, if you like Sony Ericsson's wave theme but you are tired of watching it in blue, now you can have it in a lot more colors. We're very pleased with the interface response. It's zippy throughout, probably due to the lower screen resolution (HVGA instead of WVGA or higher). And the UI is well optimized for the smallish screen. The web browser has full Flash support with the Adobe Flash 10.3 player (available for free at the Market). YouTube videos at 360p played quite smoothly but you'll have no problems with 720p too, once the video has loaded. Playing Kongregate Flash games is no problem on the Sony Ericsson Xperia active too. The Timescape brings all your communications together: an aggregate view of your SMS, MMS, email, call log, Facebook and Twitter updates. You can easily filter the contents by type and get all relevant information in one place. With Timescape you not only see the latest activities and updates of your contacts but also share your own status, reply to received messages or return a missed call. You can set it as a homescreen widget too. There are free Timescape plugins on the Android Market for Sony Ericsson users. Currently, you can update your Timescape with mixi, Foursquare, Orkut, Gmail, Music and Photo extensions. 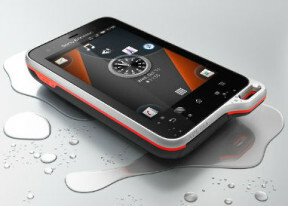 The Sony Ericsson Xperia active comes with a 1GHz MSM8255 Snapdragon processor and 512MB of RAM. That’s enough power to smoothly handle loads of apps. Gingerbread helps in this department too and HVGA resolution means the GPU has much less pixels to process. We ran our usual set of benchmarks on the Xperia active. Here are the numbers. On Quadrant it got the respectable 1730 points, which is well over some of last year’s top droids. On Neocore it went up to 66.2 frames per second, which is a good achievement. The AnTuTu pits the Sony Ericsson Xperia active against the best in class and the score of nearly 3113 points beats the likes of the Nexus S and Desire HD. Smartbench 2011 was the only mediocre score for the Xperia active. Numbers aside, the Xperia active doesn’t disappoint in terms of actual performance. It’s a very fluid and responsive smartphone and you’ll hardly find anything to complain about. The fact that in-browser Flash playback goes up to 720p trouble-free is evidence of the kind of performance to expect.